Three-bedroomed Villa Ebru in charming Kalkan, on the Turkish Mediterranean coast, has everything you need for complete relaxation. Three-bedroomed Villa Ebru in charming Kalkan, on the Turkish Mediterranean coast, has everything you need for complete relaxation. It's sitting pretty on the tree-lined hillside with magnificent views of the bay. Take a cooling dip in your private swimming pool or dine al fresco on your spacious sun terrace; with access to another large pool, top-notch restaurant and bar at the nearby hotel there's almost no need to leave, but the town centre with bougainvillaea-draped houses awaits you below. A bright-white colour scheme lets the sea and sky do the talking at this villa; shots of colour come courtesy of orange-yellow lighting, grey-green doors and potted flowers and plants in vibrant green. The floor-to-ceiling windows flood the rooms with natural light, bringing the outdoors in. There's also plenty of shaded space for children to play while you soak up the sun next to the lounger-lined crystal-clear pool. Once that sun starts to set, you'll discover one more of the villa's luxuries: spectacular views of the town, Taurus mountains and the sea from your on-balcony Jacuzzi tub. For a comfortable home-from-home stay, there's also an open-plan kitchen and living area, well-equipped with everything you might need for eating in. The cushioned sofas are perfect for spending some quality family time indoors, as is the table tennis outside. All the bedrooms at Villa Ebru are all equally stylish and spacious, with two rooms on the ground floor and one on the second. Each bedroom has a balcony for soaking up the fantastic setting, as well as an en-suite and flat-screen TV. If you can bring yourself to leave this luxury villa, Kalkan town centre is a short 10-minute' walk away. The old fishing town, turned popular holiday destination, still retains its old-school charm and laid-back atmosphere. Head to the harbour with waterfront restaurants, browse the boutique-lined cobbled streets or head to the bay for swimming or afternoons on the sand. Of an evening the sophisticated roof top restaurants are a gourmet's delight. With the majestic Taurus Mountains nearby alongside ancient sites and exciting walking trails, you won't be disappointed. -Open plan fully fitted kitchen and living area. -Pool 10m x 4m, 1.5deep, also shallow portion into which sunloungers are placed. 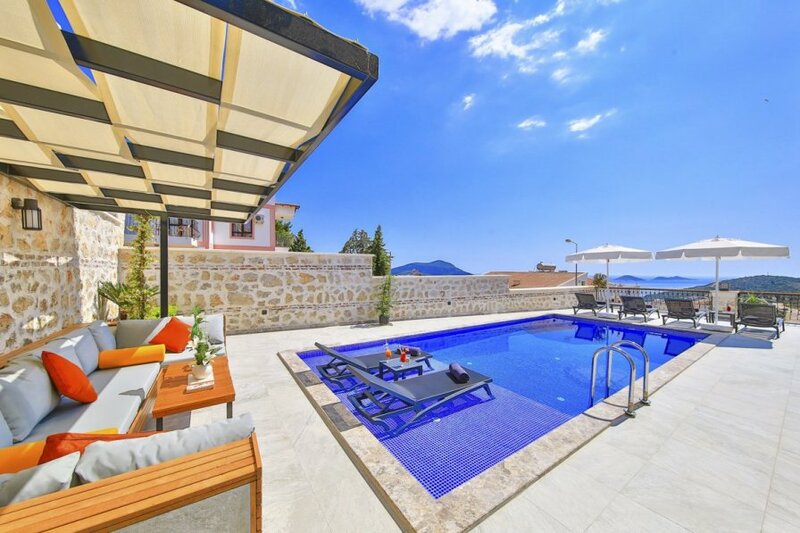 Villa Ebru is in the Kiziltas, a beautiful area of Kalkan on Turkey's coast. This friendly and laid-back harbour-side town boasts the majestic pin tree-lined Taurus Mountains as a backdrop and has a grand sweeping Mediterranean bay. It's a fantastic base to visit the Lycian ruins from or engage in the many local activities. Apart from the main pebble beach near the marina, where you can swim in the sheltered waters or relax on the soft sandy shores, there are many beach clubs set into the rocks, offering restaurant and bar service to your sunbed. The town centre itself has winding cobbled streets that run along, and rise away from the waterfront. The restaurants are either on roof terraces, offering views across Kalkan's rooftops to the sea, tucked in charming corners or are directly on the marina and beach front. There are shops and markets selling everything from homemade rugs to fresh local produce. There are traditional barbers scattered around the town, so men can make sure they are fully groomed for an evening out. Start your holiday with a traditional pummeling at one of Kalkan's Hamam's, rubbing away any stress so you can relax and enjoy your holiday. The landscape around Kalkan is diverse in exciting walking trails, including the famous Lycian Way Trail. From gentle half-hour walks to more strenuous full-day excursions, you can discover a wealth of history and culture on this track. Traverse through olive groves or head to spots like the preserved ‘ghost village' of Kayakoy with hundreds of deserted, Greek-style houses and churches. History lovers can continue the culture and visit Tlos in the foothills of the Taurus Mountains, lots of other ancient sites such as Letoon, Patara and Xanthos are less than an hours drive away. Patara, said to be the birthplace of St Nicholas, houses a government building where democracy was born, an ancient lighthouse, central Agora and large theatre. St Nicholas went on to be bishop at nearby Myra, which is just over an hours drive in the other direction. For more fun day trips, you can jump on a boat from Kalkan Harbour explore the bays and snorkel and swim or scuba dive at one of the local scuba schools. Saklikent Gorge, a beautiful river and 18km canyon is also well worth a visit, where the athletic can walk in the waters through the canyon. You can combine a trip to the ancient site at Tlos and take lunch in one of the many trout restaurants, such as Yakapark. For relaxing downtime, apart from the beach in the centre and Kaputas, a perfect little sandy cove about 7km east of Kalkan, there's Patara's sandy beach. It's rich in wildlife and is the breeding ground of the endangered loggerhead turtle. On the approach to the beach you can stop off at the area's ancient ruins; a vast theatre as well as impressive Roman Baths.